Talk about easily getting people confused! Today, we will be looking at two apostles named James and Judas but they’re not the men with whom we are most familiar. 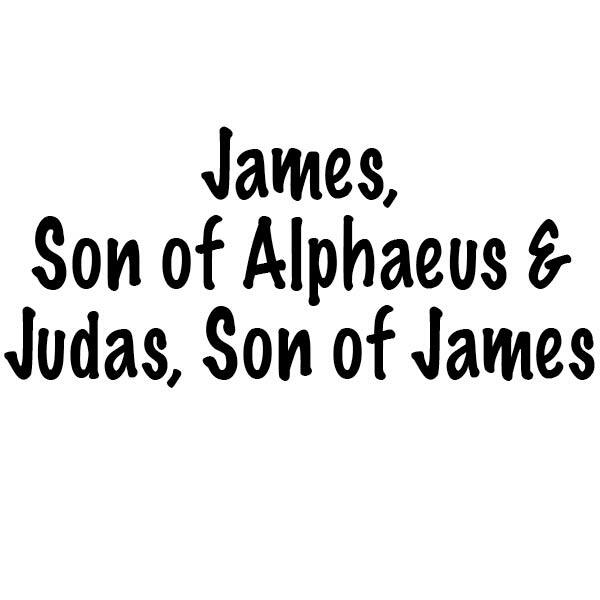 James son of Alphaeus and Judas son of James were given common names but they were uncommon men. To start from the beginning or to learn more about the other apostles covered, click on the People of the Bible tab under the header or click here. James son of Alphaeus is often called James the Less or James the Younger. He was not less in the sense of worth. The Greek word for less means minor, less, little, or young. The scholars turned to this terminology to distinguish him from James son of Zebedee, brother to John, who is sometimes called by the name James the Greater. Judas son of James is generally identified by the following names: Thaddeus, Jude, Jude Thaddaeus, Judas Thaddaeus, or Lebbaeus. Matthew 10:3 in the King James Version of the Bible lists him this way; “Lebbaeus, whose surname was Thaddaeus.” Lebbaeus translates “breast child; child of one’s heart; a man of heart.” Some scholars believe he is the author of the epistle of Jude. Scripture has little to say regarding these men but they lived their lives not for their glory but for the glory of their Lord. They answered when Jesus called. Their loyalty, their eagerness, and love distinguished them from all of the other followers to be chosen as part of the Twelve. Many people serve as faithful followers of Jesus and are never known by name. They are anonymous workers for the Lord to man but not to the God they serve. Just as Jesus knew their name and their character, he knows those of us who serve him without fanfare and accolades. Beyond the listings of the Twelve Apostles in the gospels, this verse highlights Judas. The night of the Last Supper was a confusing one for the apostles. They felt the tension of impending trouble to come. Jesus talked of leaving and returning, of the bread and wine being his body and blood, and of a betrayer among them. Jesus told them that if they loved him and obeyed his commands, he would ask God to give them the Holy Spirit to be with them forever. He continued by saying that he would show himself to them but not to the world. Judas wonders why them and not others. His confusion would turn to understanding at the resurrection of Jesus. On that day, James son of Alphaeus and Judas son of James saw the risen Christ and knew without any doubt that Jesus was the Son of God. What can I learn from the life of James and Judas about faith? Do I live for my own glory or for the glory of the Lord? Who do I notice around me who faithfully serves God quietly? How can I encourage them?